Strathy Point is one of the best places to observe seabirds in the North Coast of Scotland as it lies under one of the major migration routes. The most common birds to be found here are Great Skua, Kittiwake, Fulmar, Cormorant, Oystercatcher, Elder and Ringed Plover. You may also be rewarded with sightings of seals, whales, porpoises and dolphins. 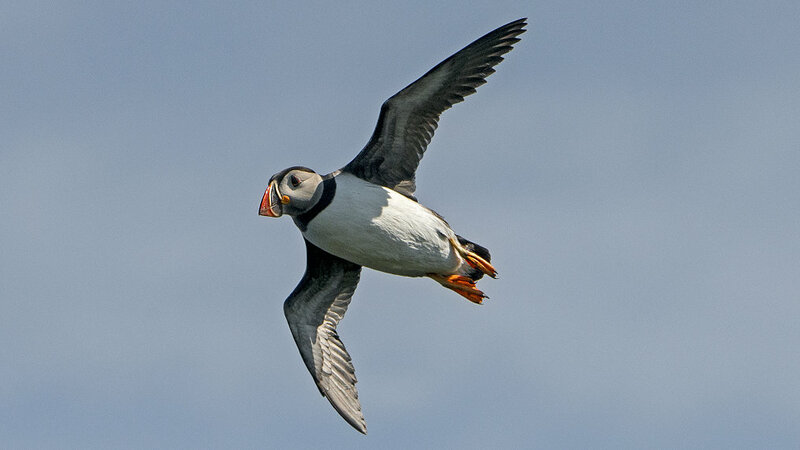 But our favourite birds is the delightful Puffin just by our B&B. The Atlantic Puffin is the most instantly recognisable and popular of all North Atlantic seabirds. The puffin is a member of the Auk family and is sometimes known as the Sea Parrot as it is so colourful. 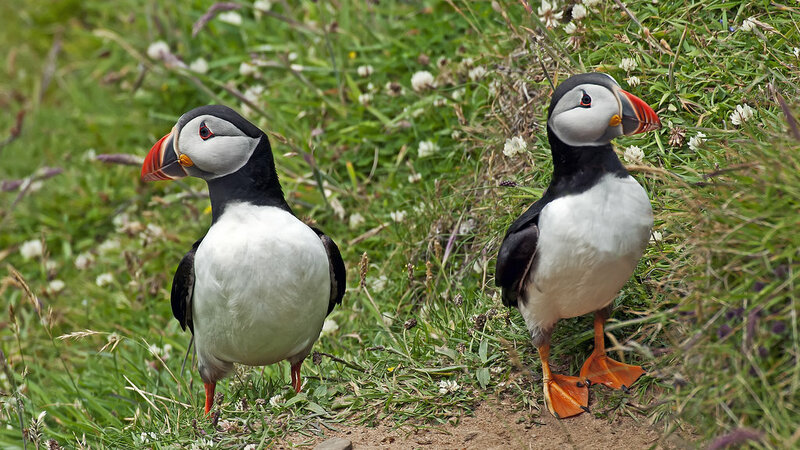 The puffins come ashore late April to breed and are usually to be seen until the middle of August. Puffins nest underground in burrows and a colony can appear to be deserted during the middle of the day as the puffins are either in their burrows or out at sea feeding. At other times of the day, they can be seen standing on the stopes, bobbing around on the sea or flying. Chicks are fed on small fish that the adults carry cross-wise in their beak such as sand eel, sprat and herring. Evenings can be a good time to see the puffins. The largest local puffin colony to Strathy is on the sea stack at Drumhollistan on the Sutherland/Caithness boundary grid NC919656. You can park at the layby at the Caithness boundary sign and head towards the sea along the peat track, just past the sign (about 2km, there and back). There are also good kittiwake, guillemot, razorbill and shag breeding areas here too. 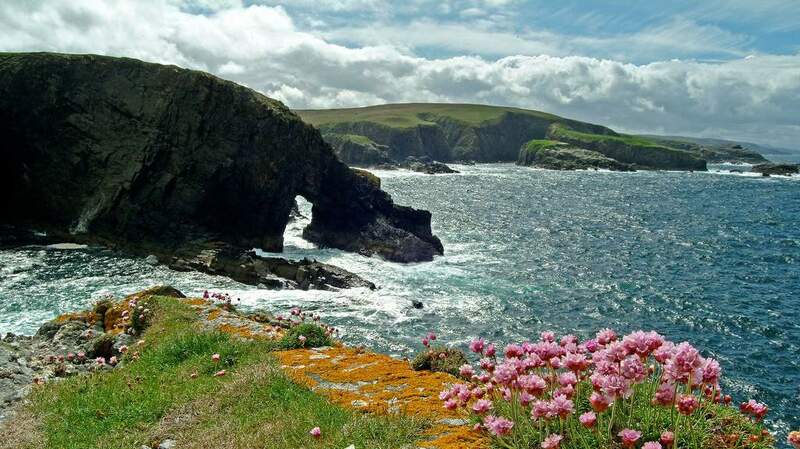 Walking the coastal cliffs from Drumhollistan cast along towards Reay also provides great puffin and other seabird nesting areas and superb cliffs. This is a good route to take close-up photographs of the puffins as they stand on the mainland just below as you walk. Or email: [email protected] for bookings. Dunnet Head (RSPB Reserve) – For the best location to see the birds, walk back to the outside of the walled car park area and follow the outer wall down towards the cliff edge. The area is unfenced, so care must be taken. Look back to below the main viewing area at grid ref. ND20276, which gives a better view of puffins and other birds. RSPB offer guided walks on occasions too. Duncansby Head has several small areas where puffins frequent the grassy slopes, some distance from the safe fenced areas, and nearer to the giant sea stacks, grid ref. ND400720. Walking by the fence line north of Geo of Sclaites around grid ref. ND406232 can also provide some views of small numbers of puffins along the grassy slopes. 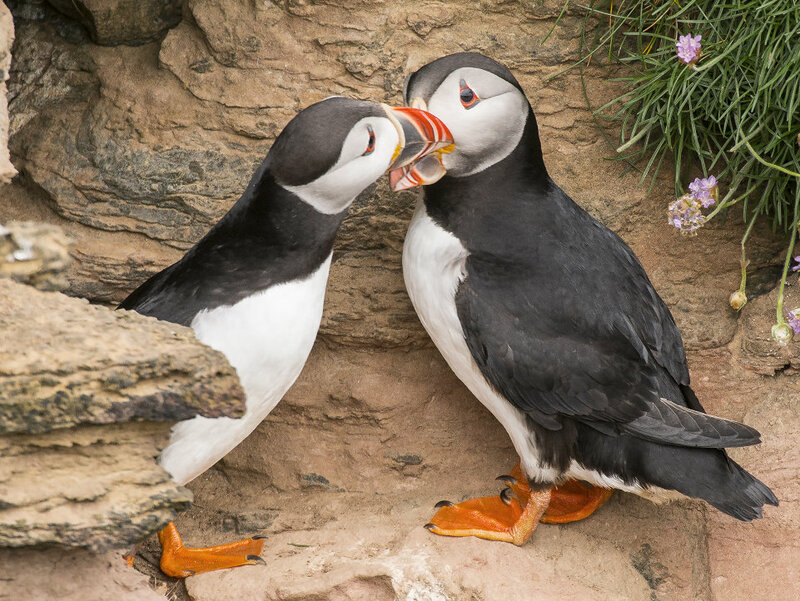 Heading south, another good place to see puffins is on a sea stack at Dunbeath by Laidhay Croft Museum and Tearoom, you will benefit from having binoculars. Ample car parking is available at the Museum. 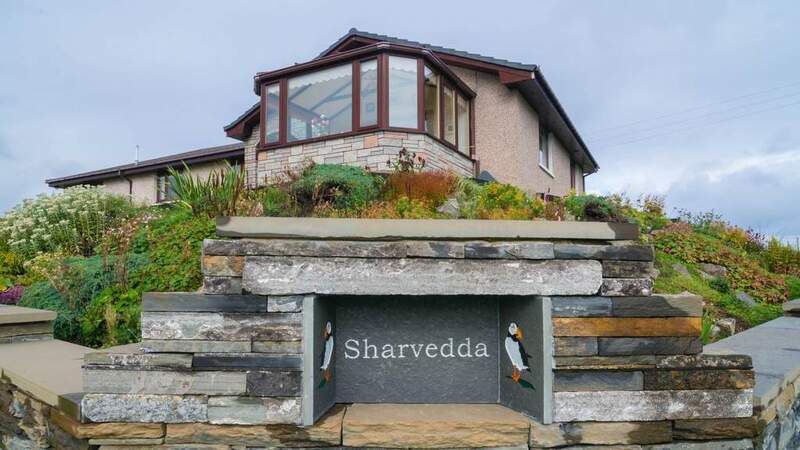 Take a short walk past the Museum and head towards the private house, access to view the puffins is through this private garden, so do ask for permission. The owners are very helpful. Do leave the gates as you find them. There are often sheep grazing in the field. Follow the track down to the coast and follow the fence line south until you see a sea stack. The puffins nest near the bottom on the grassy area, and there are often around 200 birds in this location. 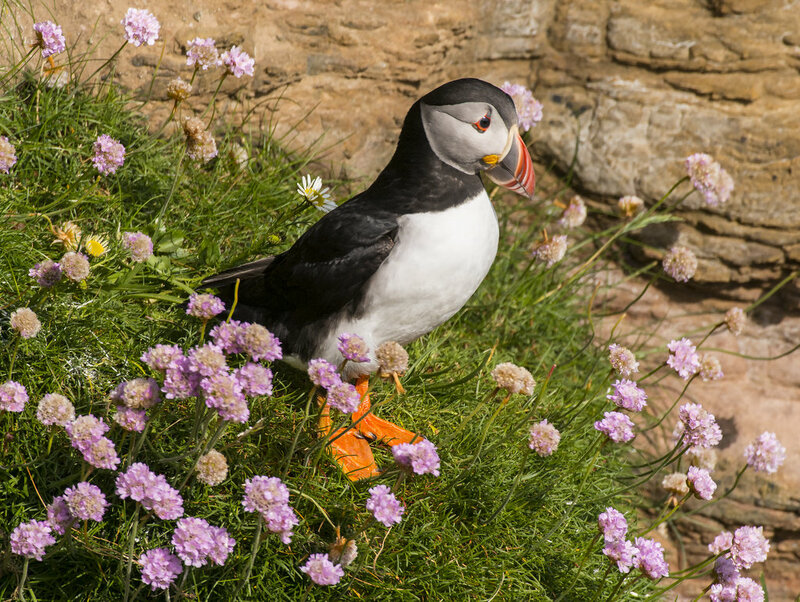 Everyone should see a puffin in its natural habitat at least once in their life and there is nowhere no more beautiful to do it than here in the North of Scotland.